When I first started this blog almost two years ago, I wrote a post of 10 things to know about me. I thought it was time to reveal 10 more fun facts about me! Because I am so involved in theater now, people are often surprised to learn that I played sports when I was younger. I mean, I'm definitely not the most athletic person, but I think I held my own out there! At some point, I participated in all of the following: cross country, soccer, softball, track, volleyball, and basketball. My favorite was definitely volleyball! I mentioned in my first "things to know about me" post that I am a creature of habit and like to rewatch the same TV shows over and over again. Well some of my favorites are How I Met Your Mother, Parks and Recreation, Friends, The Office, Gossip Girl, and Gilmore Girls. If I watched nothing but those shows for the rest of my life, I would be content. I am obsessed with dogs. When I was younger, I actually demonstrated such a love for all animals that my mom thought I might grow up to be a vet. While I still have a soft spot for all animals, dogs are definitely my favorite. I love puns. A play on words is my favorite type of humor. When I was a baby, my left foot was turned out so I had to wear a cast to correct it. It was right around the time I was starting to crawl and it was a little bit of hindrance. I would have to drag my casted foot behind me as I was trying to get around! I have no artistic ability whatsoever. I can't draw to save my life. It's sort of a family trait- Pictionary is an interesting experience in the Rasmussen family. My favorite role I've played so far in a musical was actually the first musical I ever did (aside from the ones we were required to do in grade school). 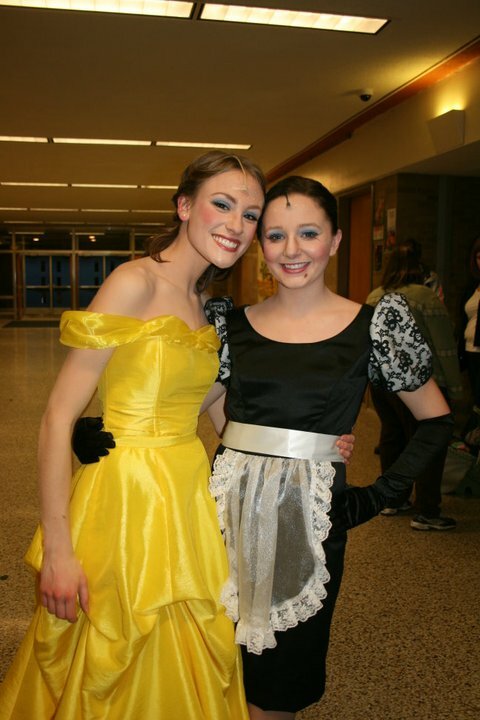 I was Babette (the feather duster) in Beauty and the Beast. They actually had me dye my hair brown for the show, which was an interesting experience in and of itself. I wear lipstick every day. The exact one I wear is Rimmel Lasting Finish by Kate in 08. It's a pretty neutral color that fades well, but makes me feel more put together, so I rarely leave the house without it. My hair is naturally curly (see photographic evidence below). For various reasons, I don't wear my hair natural most of the time. The main reason being that I live somewhere where it's winter for 9 months of the year and it's unrealistic for me to air dry my hair. I blow dry and curl it most days and will occasionally straighten it. Disclaimer: This post contains affiliate links, which means I may receive a small commission if you click on them, at no extra cost to you.